Yes, this is it! 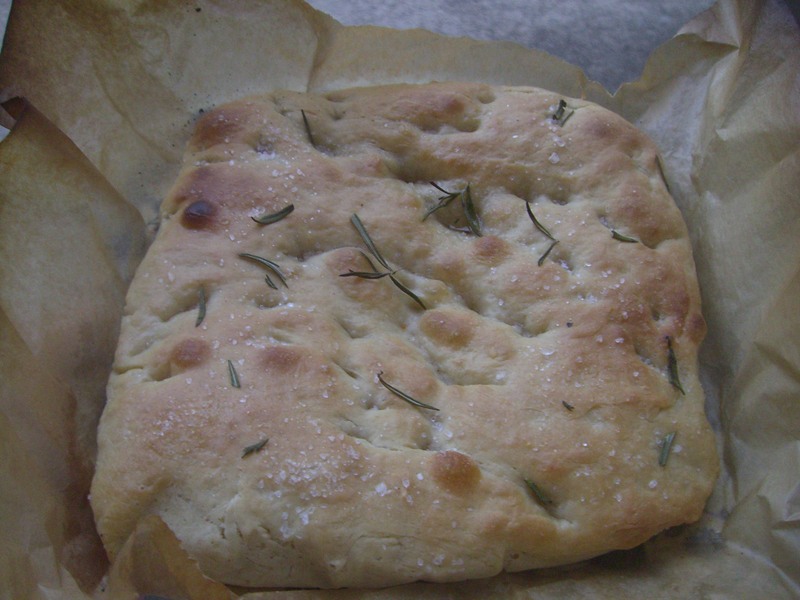 That troublesome focaccia from The Great British Bake Off that caused so many problems for some of the bakers. I’m happy to report, with slightly more than a smidgen of smugness, that my focaccia turned out perfectly! However I definitely had an edge thanks to having watched the contestants struggling with it first – I followed Paul’s recipe to a T and made sure to add ALL of the water! Here’s what you need to make the bread – good news – its probably all stuff you already have in your cupboard/garden! Just a note on the quantities – I halved Paul’s original recipe as it made two loaves – the resulting focaccia was exactly perfect for two people for dinner. If you want to feed more, just double or triple the quantities below. 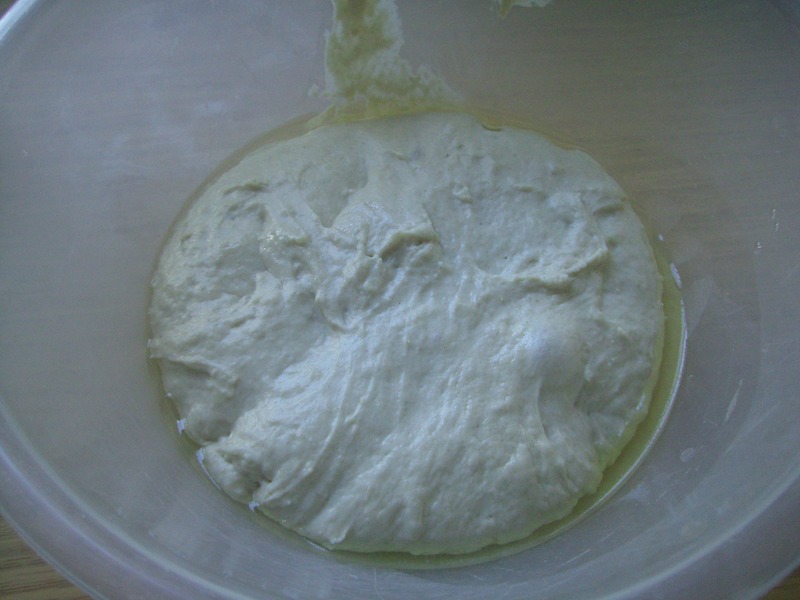 First, measure out the flour, olive oil, salt and yeast into a large bowl. Put the yeast and salt on opposite sides of the bowl as the salt will kill the yeast if it gets a chance. Now, add 150ml of the water, leaving roughly 50ml to be added. Stir the mix into a dough with a wooden spoon. Gradually add the remaining water. Important – at this point, all your bread making instincts will be telling you that the dough is too watery. But FIGHT the urge to add more flour (like that poor bloke on the bake off!). 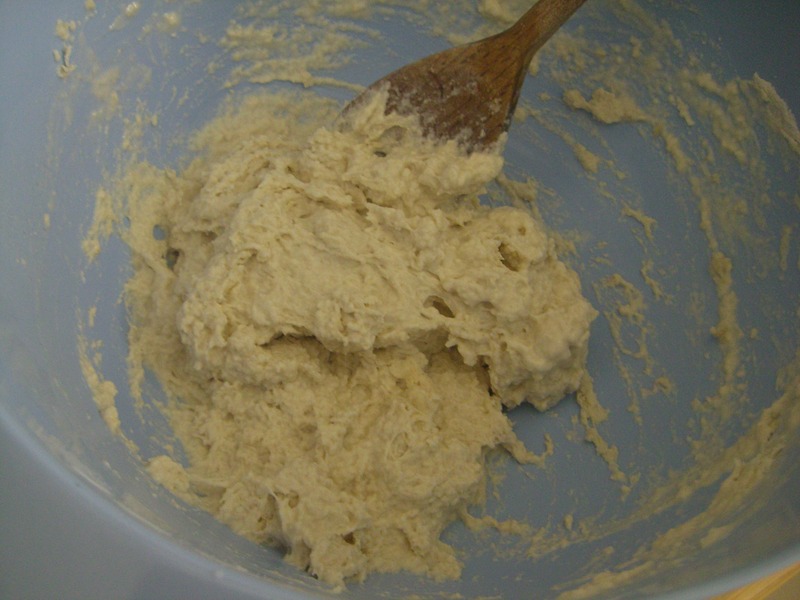 Coat your hands with olive oil and start kneading the dough in the bowl for around 5 minutes. It will be annoyingly sticky, but the focaccia will taste amazing. PERSEVERE! Be prepared to add more olive oil and wash your hands often! After kneading it in the bowl for 5 minutes, I turned it out onto an oiled chopping board and kneaded for another 5 or so minutes. Suffice to say there are no pictures of this because my hands were both completely covered in white goo. I have to say, it was a very strange experience compared with the type of breads that I more typically make, and I can completely see why the bake-off contestants went awry. You have to just accept that the dough will completely stick to your hands and get on with it the best you can. Once you think you’ve kneaded it enough, put the dough into an oiled bowl to prove. The first proving should be for around an hour, or until its doubled in size. I couldn’t detect a massive size difference in my dough post-proving and thought that the recipe had gone disastrously wrong at this stage. But I carried on regardless, and after about an hour I transferred the dough into a rectangular tin lined with parchment paper. Push the dough to the corners of the tin, and push your fingers into the dough to give it the dimpled focaccia appearance. Leave to prove in its tin for another hour, covered in a tea towel. Near the end of the second proving time, preheat your oven to gas mark 7. Just before you’re ready to pop it in the oven, sprinkle the focaccia generously with sea salt (I use Saxa), chopped rosemary and a couple of tablespoons of olive oil. Bake until its well – browned all over, around 45 minutes. Once its out of the oven, I garnished with more fresh rosemary. This focaccia bread knocked my socks off when, after the seeming failure of it to rise or behave, it produced amazing bread which Lee declared the best ever! Hurrah! 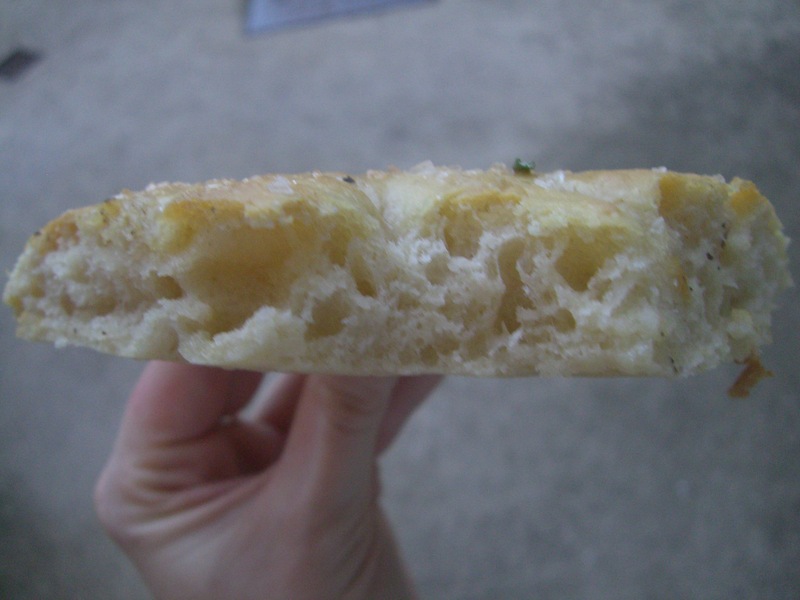 Look – my focaccia has the dimpled air holes that Paul said was the trademark of successful focaccia! YAAAAAAAAAAAAAAAAAAAAAAAAY!!!! I think we can all agree that the lesson here is never question Paul Hollywood! (And never question Mary Berry going without saying!). Yum – make this soon – its amazing! What’s your favourite kind of bread? 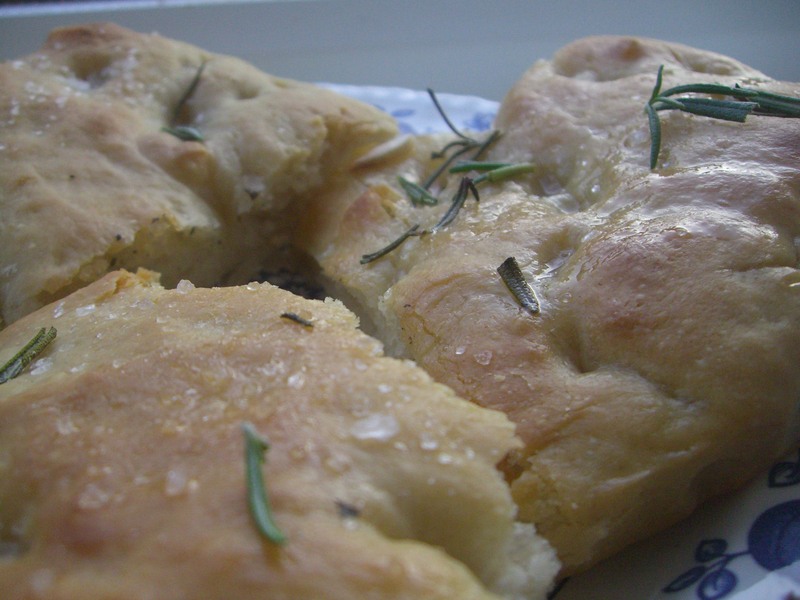 Focaccia is definitely up there for me – I love the rosemary/salt/olive oil combo! Previous Post: « Blog giveaway #1 WINNER! Thanks for your tips. I also watched Paul Hollywood’s masterclass on YouTube before I started. I used my Kitchenaid to get the dough started, then I turned it out on an oiled board and kneaded it. It was sticky and horrible, but the focaccia turned out amazing. Thanks for all your tips. Fab recipe. I cut out all the mess by mixing it in my Vitamix. Turned out wonderful. Thank you! I am wondering what size baking sheet you used. I have not been able to find any information with exact measurements. I am in the US, but CAN convert cm to inches. I used your recipe, which is Paul Hollywood’s recipe, halved. Hi Cheryl – I used a 9 inch by 9 inch pan. It really doesn’t matter what size you use, but it should have sides, not be a sheet – a brownie tin is best. Could you elaborate on the yeast amount? In South Africa our yeast sachets come in 10g sachets. So would I use 3 sachets if I tripled the recipe? I followed Paul Holywood’s recipe and halved the ingredients which you obviously did. My dough mixture was pourable using all the water but I will try again having found your site and the pictures to guide me through each stage. I have added more flour to stiffen it up so don’t expect it to work but there is always next time and I’ll crack it yet. Good luck Jim! It’s definitely worth it even if it goes a bit wrong, focaccia tastes so good! Had another go today and it worked a treat. Must have measured out too much water or too little flour last time. Hello, I am just making this, however I followed the Paul Hollywood recipe on BBC website and they say 400ml of cold water, but you only used 300ml. I wonder which it should be? Thanks Debbie! I think the amount of water you need depends on your flour and the weather too. Hope it turns out well! Just made it following your recipe and it tastes amazing! Keep up the good work! We made garlic and a red onion and rosemary ones over the weekend. Sent you a photo on twitter, they turned and tasted lovely. Thank you. Thanks so much Carol, glad they turned out well!! Hi Kerry, i’ve been getting into my baking a lot lately and Tesco’s focaccia is such a let down. Hence I’ll make my own. I’ll let you know how it turns out! Lovely recipe and al your helpful hints along the way were great, my grankids and I made it today. We didnt spreads the dough enough though as we found out when we baked it, needed to be thiner when cooked, it tasted lovely though and we will knwo next time. I just made the focaccia exactly as you have described and its so delicious. The whole house smells, I am worried neighbours will come knocking soon. Thank you for sharing. I have just read through everyone’s comments and really weant to make this bread. 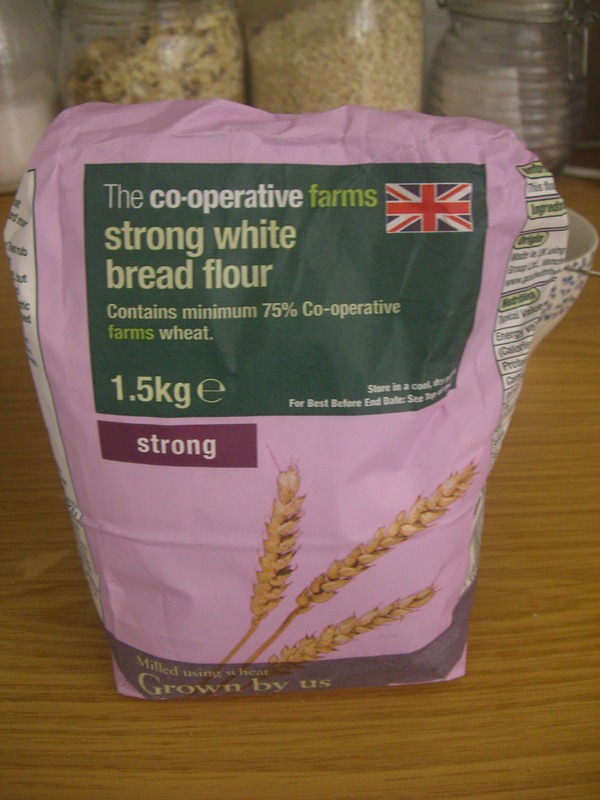 My problem is that I am coeliac and wonder if it will be alright to use gluten free flour. Not wanting to contradict Paul Hollywood too much, but you can simplify this method slightly. 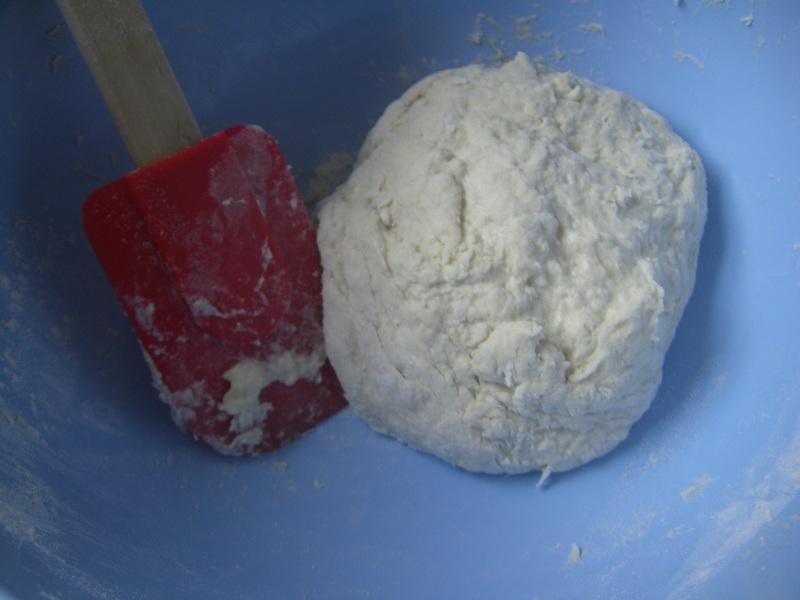 When you make such a wet dough, it is really not necessary to knead it. The warm water will develop the gluten perfectly well. So, instead of the very messy kneading technique, try using a dough whisk to incorporate all the water. Before long you’ll see that the dough is starting to pull away from the bowl sides and leaving the dough whisk clean. Then you can follow the recipe exactly the same. For information on the theory of not kneading wet doughs, Google Dan Lepard no knead bread. Thanks for the tips, this bread was a massive hit with tea tonight. This made more than enough for me & the 3 kids to share. I have Allinson dried active yeast, will this do? If so, how many grams do I use? hahaha, oh yes, I remember this! gosh seems like ages ago. I would have probably added more flour or less water. I’d have failed. Hi, I made this tonight and it was completely stuck to the paper. should I have oiled it first or anything. Half the bread was stuck to the paper. It was a shame as it tasted great. How long should I cook it for? It’s ready to go in the oven now so I’ve taken a guess at around 30 mins? I made this today and it came out pretty good. I didn’t have any fresh rosemary or sea salt so I used dried rosemary and rock salt. My main issue is that my oven is small so I should have split the dough into two or three portions as the finished product was thicker than usual focaccia. 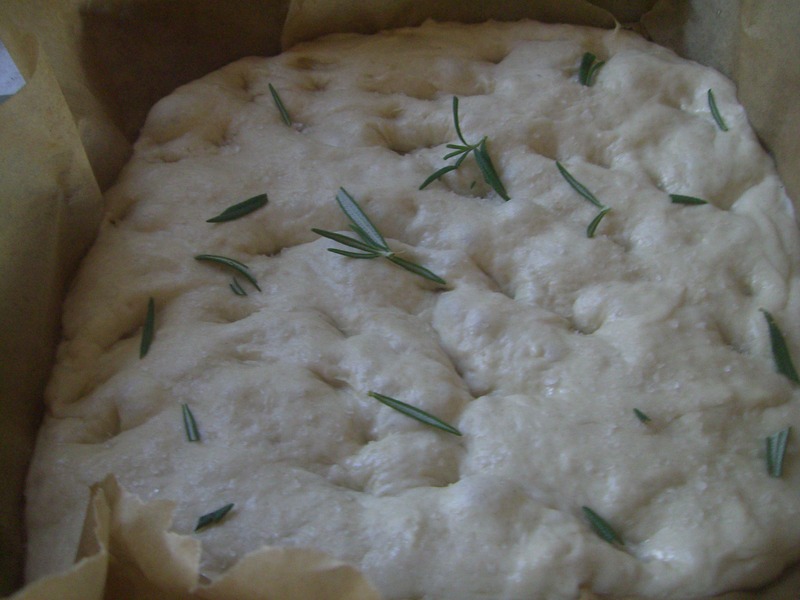 Maybe next time I will divide the dough and maybe add the rosemary, along with basil to the flour. Maybe I missed it, but I could not find the cooking time with your recipe. Thanks again for this recipe. It worked well for me. This may be a daft question but do you sieve the flour first? Hey Jason – don’t worry! I didn’t sieve it no. 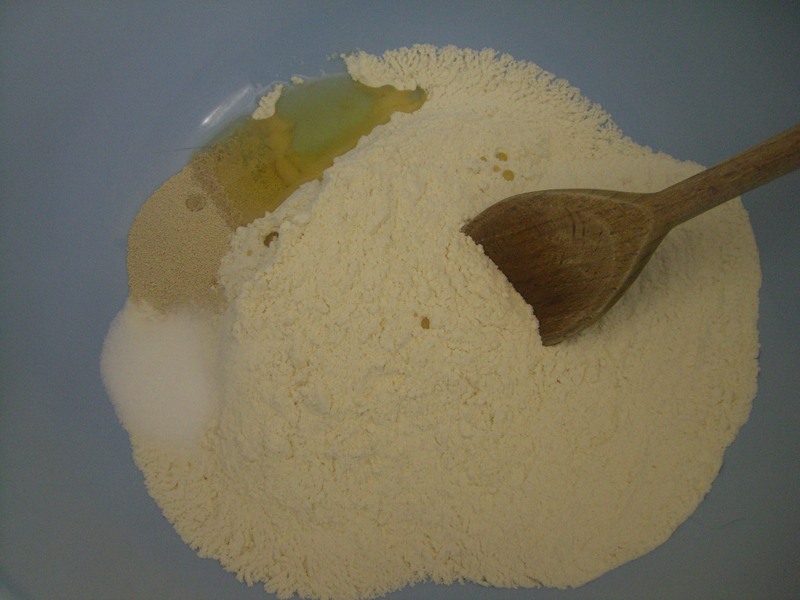 If you weigh your flour into the bowl with the yeast etc and can see any lumps, just give it a quick whisk to get rid of them. I gave this a go last night and was really pleased with the results! Definitely would have been tempted to add more flour if it wasn’t for your detailed instructions. I didn’t have any rosemary so used black onion seeds instead, yum! Awesome! happy it went well! It is very counter-intuitive to not add more flour! Thanks, I’m glad you like it! Aw I missed the masterclass! I’ll have to watch it on ondemand – thanks for the heads up! That really does look absolutely perfect! I love the Bake Off- it’s not often that I really really look forward to a programme on TV (not since Gormenghast in 2000, remember that!?). Thanks Teresa! It was actually really easy as long as you follow Paul’s recipe! I was as surprised as you lol! Hey Buddy!, I found this information for you: "Focaccia bread recipe from The Great British Bake Off". Here is the website link: https://kerrycooks.com/focaccia-bread-recipe-from-the-great-british-bake-off/. Thank you.